Super League club Castleford Tigers have signed teenage half-back Jake Trueman from Bradford Bulls. The 17-year-old, who is a product of Bradford's academy and made his senior debut in the 2016 season, has signed a two-year deal with Castleford. "Jake became available after the difficulties Bradford faced recently," said Tigers head coach Daryl Powell. "We now have some of the best young half-backs in the country to learn from the quality we have in our first team." Trueman told the club website: "I wanted to join Castleford because of the coaching staff on board. I think they can develop and improve me as a player. The club just feels like the right fit for me." A 'Greek tragedy' or green shoot of hope? 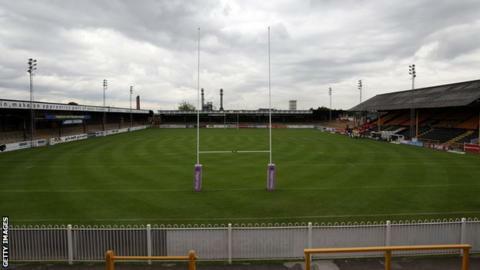 Read more on Bradford Bulls: Is professional rugby league in Britain booming or facing difficult times?